Winters in Austin are often my favorite season. It's a little bit chilly, occasionally a little cold, but it doesn't last very long. Every now and then it actually freezes or snows. But this winter has been beautiful. Cool enough to wear a sweater and jacket but nice enough to be outside almost everyday. It has certainly been great convertible weather. But the dark side of this silver lining is this. February 2016 was likely the hottest month in thousands of years, as we approach the 2°C danger limit. To put the current temperatures into context, prior to last October, monthly global surface temperatures had not been more than 0.96°C hotter than the 1951–1980 average, according to NASA. The past 5 months have been 1.06°C, 1.03°C, 1.10°C, 1.14°C, and 1.35°C hotter than that average, absolutely destroying previous records. 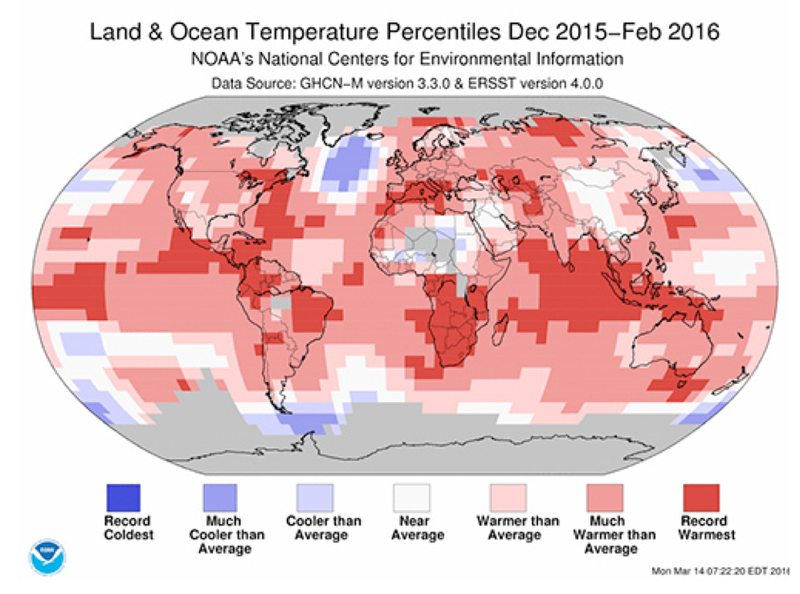 Estimates from NOAA are in broad agreement with those from NASA. The guts of the agreement hang off the so-called “long-term goal” that commits almost 200 countries to hold the global average temperature to “well below 2°C” above pre-industrial levels and to “pursue efforts to limit the temperature increase to 1.5°C”. And YET, we have a major political party in the United States that continues to place its collective head in the sand on the issue. Other big news on the climate scene comes from Jim Hansen in a paper published in the European Science Journal Atmospheric Chemistry and Physics. "The nations of the world agreed years ago to try to limit global warming to a level they hoped would prove somewhat tolerable. But a group of leading climate scientists warned Tuesday that permitting a warming of that magnitude would actually be highly dangerous. The likely consequences would include killer storms stronger than any in modern times, the disintegration of large parts of the polar ice sheets, and a rise of the sea sufficient to begin drowning the world’s coastal cities before the end of this century, the scientists declared. Hansen argues that society is in such grave peril that he feels morally compelled to go beyond the normal role played by a scientist and to sound a clear warning. That stance has made him a hero to college students fighting climate change, but some fellow scientists say they believe he has opened himself to the charge that he is skewing his scientific research for political purposes. "The nations of the world agreed to try to limit the warming to 3.6 degrees Fahrenheit, or 2 degrees Celsius, above the pre-industrial level, though they have yet to agree on any program remotely ambitious enough to achieve that goal. The Earth has already warmed by about half that amount, with the consequence that virtually all land ice on the planet has started to melt and that the oceans are rising at an accelerating pace." I remember 35 years ago when Dan Rather reported that the Reagan EPA had determined that climate change was going to be a danger to global well being in perhaps as little as 50 years. In that report, President Reagan's own EPA called for a plan which would outlaw coal by the year 2000, while placing a 300% carbon tax on oil and gas. It also called for a ban on shale oil. Now with Renewable Energy and electric vehicles available at prices that could have been only dreamed of 35 years ago, we have the tools we need to meet this challenge. So we must leap now. And we have 4 Leap years to do it.